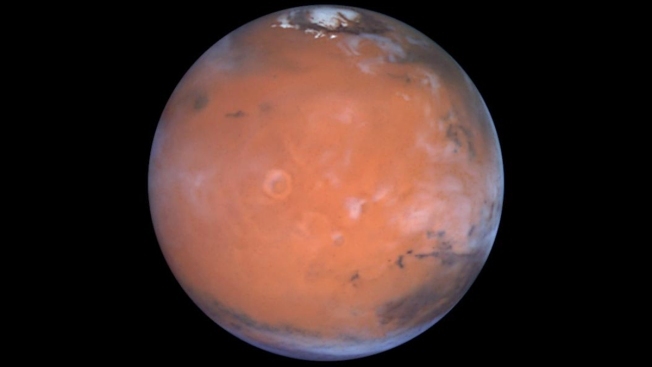 This file photo shows Mars as seen by the Hubble Space Telescope. Before humans can colonize Mars, we'll need to figure out a way to make it a bit more hospitable. But a new study suggests that "terraforming" Mars into an Earthlike planet simply isn't possible with today's technology, NBC News reported. The study, published July 30 in the journal Nature Astronomy, seems to throw cold water on those fictional terraforming schemes — along with some real-world ideas that sound like make-believe: In 2015, SpaceX CEO Elon Musk said we could warm Mars and give it a thicker atmosphere capable of supporting agriculture by detonating nuclear warheads over the planet's icy poles. There's no doubt that Mars' thin atmosphere and its soil and icy polar regions contain carbon dioxide. But the new research indicates that there's not enough of it for us to be able to trigger a sort of runaway greenhouse effect that would turn the red planet into a green one. "The bottom line is that there just isn't very much there, and it's hard to put very much back into the atmosphere," said Bruce Jakosky, a professor of geological sciences at the University of Colorado, Boulder and the study's lead author. "Our conclusion is we can't do it with today's technology."